See Christ the Judge above. How did the Lord Jesus purchase an everlasting inheritance for all those whom the Father hath given unto Him (Heb. 9:15; Rev. 5:9-10)? By His perfect obedience and sacrifice of Himself (Rom. 5:6-10, 18-19). His perfect obedience refers to what theologians call the active obedience of Christ. This is His obedience to the law of God to provide our righteousness. Through faith in Christ, His obedience to the law and to God is counted as our own. We stand clean in His righteousness. The sacrifice of Himself theologians call the passive obedience of Christ. It is passive because the sufferings came upon Himself. He endured the wrath of God due to our sin, was crucified and died in our place. It is through His active and passive obedience that Christ fully satisfied the Justice Of God. He brought us reconciliation with our God. By faith, we are no longer enemies of God, but children! He gave us an everlasting inheritance in the kingdom of heaven, i.e., in eternity and in the new world. All these things and every spiritual blessing and grace are thanks to the twofold obedience of Christ. ...Jesus' actively fulfilling all the law of God. This active obedience is imputed to the believer when he believes, that is, God reckons to the believer the righteousness of Christ when the believer trusts in Christ and His work. This is the doctrine which teaches that the Lord never broke a commandment and obeyed the whole Law of God is His active obedience. He had to obey, He was active in obeying God. In contrast, His passive obedience was in receiving the curse of the law on our behalf. It was something done to Him, not by Him. The main passage that speaks of the Lord’s active obedience is Romans 5:18-19. Therefore, now I will attempt to give a case for Christ’s active obedience based on the exegesis of this passage. Rom. 5:18-19 Therefore, as one trespass led to condemnation for all men, so one act of righteousness leads to justification and life for all men. 19 For as by the one man's disobedience the many were made sinners, so by the one man's obedience the many will be made righteous. ... to us is summarized in Romans 3:23-26: “for all have sinned and fall short of the glory of God, 24 and are justified by his grace as a gift, through the redemption that is in Christ Jesus, 25 whom God put forward as a propitiation by his blood, to be received by faith. This was to show God's righteousness, because in his divine forbearance he had passed over former sins. 26 It was to show his righteousness at the present time, so that he might be just and the justifier of the one who has faith in Jesus.” A great substitution has taken place where Christ has taken the punishment of all the elect upon Himself and thereby satisfying the holy wrath and law of God. Those who seek Him will indeed find Him (Jer. 29:13; 33:3). He does not reject those who seek Him, yet He rewards them (Heb. 11:6), although they don’t deserve it (Luke 17:10). It is our duty to do the will of God and seek Him. Those who seek God realize that it was God Who was seeking them (John 6:44). God’s rewards to the righteous are by grace and gracious covenant and not by obligation. The Lord Jesus taught us in Luke 17:10, “So you also, when you have done all that you were commanded, say, ‘We are unworthy servants; we have only done what was our duty.’” Even if we did all that we were commanded, which we are not able to do, we still are unworthy slaves, deserving of no rewards. Therefore, how gracious and merciful God is toward us that He even rewards our works, which are always stained with sin, and for the sake of Christ, pours out on us His immeasurable grace. The Justice Of God means that He hates “all sin, and…will by no means clear the guilty.” The Justice Of God is demonstrated in bringing judgment upon the godless in this life and also in the next. The Bible teaches that not only does He hate the sin, but He also hates sinners (e.g. Ps. 5:5-6; 11:5; Rom. 9:13). This doctrine is difficult. We cannot equate the righteous and holy hatred of God with human hatred, which is motivated by sin. Since God is sinless and altogether holy, His hatred, therefore, is likewise sinless and holy. The hatred of God against sin and sinners was demonstrated on the cross in that the Father sent His only Son to die a terrible death and bear the wrath of God on behalf of His people. On the cross, both the wrath and love of God were demonstrated. God does not simply forgive us without sacrifice. Rather, He provided the sacrifice which would provide satisfaction to His holiness and His law. We have defied His holiness and we have broken His law. God cannot simply push sin under the rug, but He must deal with it because He is not a corrupt judge, but He is the righteous Judge of all the earth. God punished His Son, as the Substitute on behalf of His people, so that His people can be forgiven and given the righteousness of Christ. In this way, God is Just and the Justifier of those who believe in the Son. See for more on this, see chapter 11. ... they stand solemnly bound to each other to perform the conditions contracted for. The immediate and direct end therefore, of God’s entering into covenant with man at any time (so far as concerns man himself) is the advancing and bettering of his state. God never made a covenant with man in which his goodness to him was not abundantly manifest. Yes, such is his infinite bounty that he has proposed no lower end to his covenant transactions with men than to bring them into a blessed state in the eternal enjoyment of himself. And therefore, when one covenant (through the weakness of man in his lapsed state) has been found weak and unprofitable as to this great end of a covenant because insufficient to accomplish it, God finds fault, abolishes it, and introduces another in which full provision is made for the perfect salvation of those that have interest in it (Hebrews 8:7, 8). 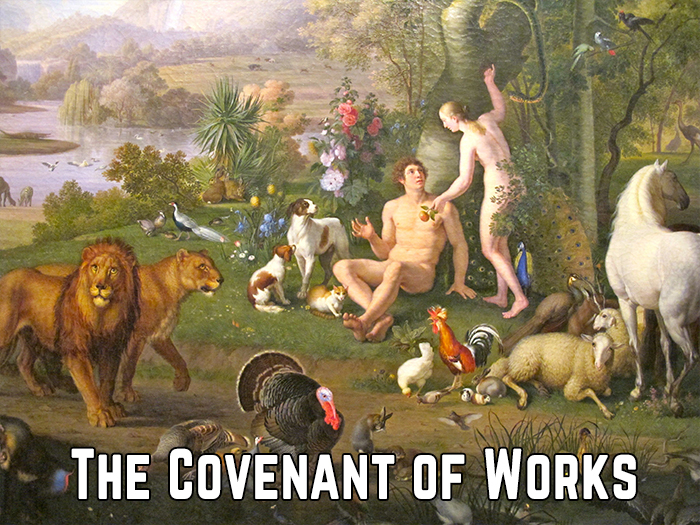 Now that we know what a covenant is, let us delve into the covenants of which the Bible speaks. ...nst God’s elect is laid in the verse before, namely, that God gave His Son “for us all” (v. 32). This furnishes the foundation on which every believer may say, “since Christ died for me and I am in Christ, ‘There is therefore now no condemnation’ for me (Rom. 8:1).” Furthermore, the reason that no charge can be established is that the Judge of all the earth has already declared us righteous in His sight. Likewise, no one is able to condemn us because Christ died for us and thereby satisfied the wrath of God against our sin (Rom. 3:23-26; 2Cor. 5:21). A substitute received the punishment and became a curse on our behalf (Gal. 3:10-13). Therefore, the Justice Of God was satisfied on behalf of those for whom this payment or ransom was made. Not only did Jesus die and that His death was substitutionary for those for whom it was made, but He is also the One Whom death could not hold—He was raised! The primal fruit of His resurrection which Paul mentions in this passage is His intercession “for us.” Following upon His death and resurrection comes His work of intercession. Notice also that the group for whom the Father gave up the Son, namely, the “us”, is the same group who are justified, for whom Christ died and for whom Christ is interceding at the present time! Dr. Owen obviously does not neglect to take a look at the book of Hebrews in connection to this subject, as it largely deals with the priestly office of our Savior and His priestly work on our behalf. We have tried to exegete some passages from the book of Hebrews in connection to the atonement below. The reader is referred to the chapter for the rest of the passages which he surveys (e.g. Heb. 7:24-25; 9:11-13; 10:19-22). The fruits of Christ’s intercession is the application of the work of redemption to those for whom it was intended. It is the granting of the gift of faith, it is the calling, justification, adoption, sanctification and all the countless graces of God poured out upon us. ...ction between him and his posterity. (2.) When Adam sinned, all were declared sinners, he being the representative of the race. The objection to this is, that ‘sinned’ is not equivalent to ‘were regarded as sinners,’ It makes the parallel between Adam and Christ more close than the passage, thus far, appears to warrant. The children of Adam, we, are already born under God's judgment because of what Adam did in the Garden on our behalf. Some may be offended by this doctrine of Adam's Federal Headship, but there is no questioning the Justice Of God, it is what the Scriptures teach. We must deal with it! Let us not forget how we are saved and made righteous. We are saved also by way of Federal Headship–that of Christ, and not of Adam. It is not because of our works that we are saved, but because of Christ's works that we are saved (Rom. 5:18-19). Somebody else represented us before God and did for us that which we could not do. So before we dismiss Adam's Federal Headship, let us not forget about Christ's Federal Headship. If we dismiss that, we also dismiss the only way of salvation and justification. See for more on justification and imputed righteousness, chapter 11. All actual transgressions proceed from this original corruption of Adam and Eve (Matt. 7:17-20; 15:18-20). Through this original corruption, the nature of man was distorted and separated from God whereby it was made opposite to all good, and wholly inclined to all evil (Gen. 8:21; Rom. 3:10-12; 8:7-8). And from this corruption do all our sins spring and have their origin. Here follows the classic Reformed doctrine of Total Depravity from the acronym TULIP. I, and many others think it is better termed Total Inability. Total Depravity gives the idea that we are as bad as we could be, which is obviously not true and not the historical sense given by the name. Rather, what is communicated by the phrase is that the total, i.e., whole, person is depraved and sinful. There is not an inch in us where sin does not dwell and have its reign in us. On the other hand, Total Inability better expresses the point of the doctrine in saying that we are totally unable to do anything that is pleasing to God. Let's define Total Depravity. This is a pretty good definition of what Calvinists believe about the state of the unregenerate man. Now let us see what the Bible says. Here is a list of verses on Total Depravity.